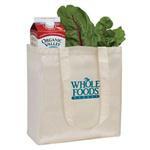 This is the ultimate custom shopping tote bag at the ultimate price. Holds up to 30lbs!!! 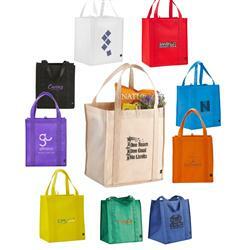 This eco friendly item is 100% recyclable and actually made of recycled material as well. The recycle symbol is shown on the outer tag. 10" gusset and supportive bottom board. Reinforced binding on edges. 10" drop handle height. 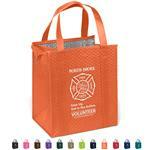 Lightweight, durable, fire resistant, air permeable, hand washable. 80 gsm. FREE 1-DAY RUSH PRODUCTION AVAILABLE! ON SALE NOW. Available Colors: Black, ocean blue, green, hunter green, natural, orange, lime, purple, red, royal blue, white, yellow and bright green. Dimensions: H 15" x W 10" x L 13". Typical Imprint Area(s): W 5" x H 8". Available Imprint Options: Screen Print or Transfer. Carton size H 23" x W 14" x L 16". Carton pack 90 pieces, Carton weight 19 lbs.